If you have diabetes, you may have heard that bananas are too sweet or too high in sugar to fit into your diet. This common belief is related to the fact that bananas are high in carbohydrates, which the body converts into sugar, and because they are rumored to have a high glycemic index, a measure of a food's impact on blood sugar levels. However, bananas actually have a low glycemic index and are a nutritious food that can be an asset to a healthy diet. The American Diabetes Association (ADA) recommends fruit be included in a diabetes meal plan. 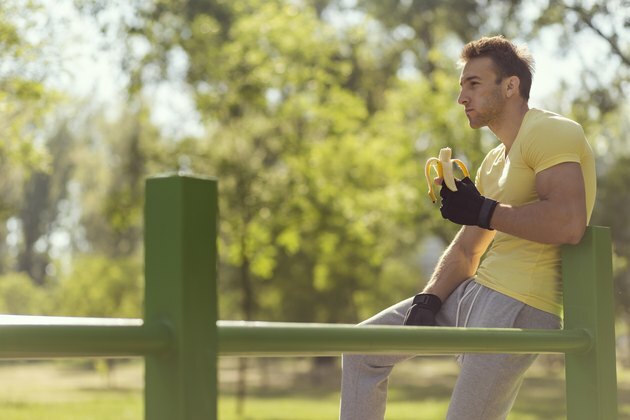 As with any fruit, bananas can fit as long as the carbohydrates are factored into the plan. Carbohydrates converted to glucose during digestion, and with the help of insulin, glucose provides energy and fuels your cells for action. However, people with diabetes either have sluggish insulin, or don't make enough insulin, and as a result, have high levels of glucose circulating in the blood. To best manage blood sugar or blood glucose levels, it's helpful to eat moderate portions of carbohydrate-containing foods and to spread these foods throughout the day. Fruit contains carbohydrate, and a medium banana contains about 30 grams of carbohydrate -- the same as a sandwich made of 2 slices of bread. If you know your carbohydrate goals, you can decide which carbohydrate foods to eat at your meals and snacks. For example, if your goal is 45 grams per meal, and you want to eat a banana with your sandwich at lunch, you can either eat a whole sandwich at 30 grams plus one-half banana at 15 grams, or you can choose to eat one-half of the sandwich so you can eat the whole banana. In addition to being a carbohydrate-rich fruit, bananas are often rumored to have a high glycemic index (GI), which is a measure of a food's blood sugar response. According to the international GI database, which is managed by the University of Sydney, a ripe yellow banana has a GI of 51, and is categorized as a low GI food. To further support its lower GI status, a study published in the March 2011 "Western African Journal of Medicine" reviewed the blood sugar response of commonly consumed fruits in Nigeria, demonstrating that bananas showed a similar post-meal blood sugar response compared an equal carbohydrate quantity of other common fruits including mango, orange and pineapple. Study authors concluded that any of these common fruits are acceptable in the diabetes meal plan. ADA recommends that the amount of carbohydrate be the primary focus of meal planning, but that a food's GI can be useful in fine-tuning food choices if better management of post-meal blood sugars is needed. There are numerous health benefits of bananas. They are low in calories, and good sources of potassium, fiber, vitamin B6, vitamin C and manganese. A diet that includes fruit is widely supported for human health and for the management and prevention of chronic health conditions. The ADA, in its 2016 standards of medical care, outlined that individuals with diabetes should include carbohydrate foods daily including whole grains, legumes, vegetables and fruits. ADA guidelines do not restrict fruit, other than to recommend that fruit be consumed within carbohydrate targets. To further support the role of fruit in the diet, a study published in the August 2013 issue of "British Journal of Medicine" concluded that consumption of whole fruits, including bananas, was linked to a decreased risk of type 2 diabetes, while a consumption of fruit juice was linked to an increased risk of this condition. Bananas can be a nutritious addition to a diabetes meal plan. However, they are a source of carbohydrates and need to be factored into your meal plan. In addition, whole bananas are a better option compared to bananas in smoothies or juices. Meet with a dietitian if you need to learn more about meal planning for diabetes, and to learn your carbohydrate gram targets for meals and snacks. If you have questions about managing your diabetes or if your blood sugars are not in control, speak with your doctor or diabetes care team. What Fruits Should Diabetics Avoid?